According to Springboard, shoppers have still been visiting retail destinations this Easter Weekend, despite rain across much of the UK. Weather improvements on East Sunday saw retail footfall increase by 0.7% across the UK however, footfall up to 12pm on Easter Monday has seen a decline due to further rain. 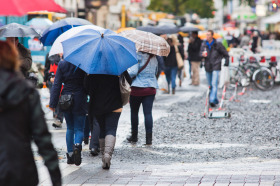 The rainy weather that hit most of the UK this Good Friday and Easter Saturday has negatively impacted retail footfall results across high streets, while boosting footfall in retail parks and shopping centres. When the rain eased on Sunday consumers were encouraged to venture out into high streets once more and consequently footfall rose by +1.9%. Springboard insights director, Diane Wehrle said: "Despite poor weather, shoppers have definitely been visiting retail destinations this Easter Weekend. Footfall in retail parks and shopping centres increased by +5% compared to Good Friday and Easter Saturday last year, but the persistent rain has definitely impacted high streets." "In the regions that had rain on Friday and Saturday, footfall was noticeably down on high streets (by -9.6% on Friday and by -6.9% on Saturday) which pulled the overall result for high streets down. "Despite positive results on Easter Sunday, retail footfall up to 12pm on Easter Monday has taken a tumble. This decline was undoubtedly caused by rain that hit much of the UK in the morning and also likely to be due to the fact that shoppers had already made their trips earlier in the weekend." Diane Wehrle added: "The greater number of high streets compared with retail parks and shopping centres means that the drop in footfall in high streets pulled the overall result for all UK destinations down (to -2.4% on Good Friday and -3% on Easter Saturday)." "The appeal of retail parks and shopping centres is likely to be the draw of discounts offered by multiple retailers after a poor trading period this year," Diane continued. "As well as this, the timing of national payday before Easter Weekend will also have helped to boost shopping trips as households were likely to have some discretionary spending budget available that had not yet have been spent or allocated. "For bricks and mortar stores to be able to continue to attract shoppers generally, but particularly over key trading periods when consumers have so many other spending options, then they must work at enhancing their store environment and product ranges so they can compete with the convenience and choice offered online, but also with their competitors. This is where retailers which recently failed such as Toys R Us and Maplins went wrong – and also a number of other retailers which are struggling to achieve sales – they have not adapted sufficiently to provide a bricks and mortar retail offer that matches current consumer demands."